Last year everything was made from bamboo…this year it’s hemp. Good news for gardeners though, especially if you need twine for vine tying and staking. The usual plastic twine disintegrates in about a hundred years and is made from petroleum products. Cotton twine is short lived and may have to be replaced during the growing season. Jute twine can mildew before you even use it and green jute is dyed with toxic chemicals. Industrial hemp twine is the perfect alternative for gardeners. It is grown without chemicals, pH neutral, resistant to moisture, mold and mildew, UV resistant, strong, durable, biodegradable and reusable…and CHEAP! Growing your own vegetables is a treat but not always practical. Bad soil, lack of time and not enough growing room makes it difficult. English gardeners use “allotment gardening”. Allotments are the precursors to our community gardens or “pea patches”. Google “allotment gardening”. Fascinating. If you don’t have enough room in your own yard, you can usually find a neighborhood “pea patch” where you’ll have plenty of room to grow all the produce you’ll need. If that still sounds too time consuming get your seasonal produce from either a local farmer’s market or a CSA (Community Supported Agriculture) group. CSA’s show up at local farmer’s markets but you can also contract one of the CSA members and receive weekly boxes of organic, homegrown produce. Vegetables grow great in containers too if you want to give it a try on a small scale. For the past 30 years the Perennial Plant Association has chosen a “perennial plant of the year”. This year it’s the Baptisia Australis, also called Blue Indigo, Wild Indigo and False Indigo. It is native to the eastern half of the country but will grow very well in our area. It is 3 feet tall and 2 feet wide and grows in full sun and part shade. It has beautiful pea-like blue flowers that blooms mid spring. Baptisia used to be difficult to find but now that it’s a “perennial plant of the year”, I’m guessing you won’t have any trouble finding it. Reading takes a back seat to gardening when the weather improves but if you like to garden with a little iPod music, you’re just a soft click away from a good gardening reference book. 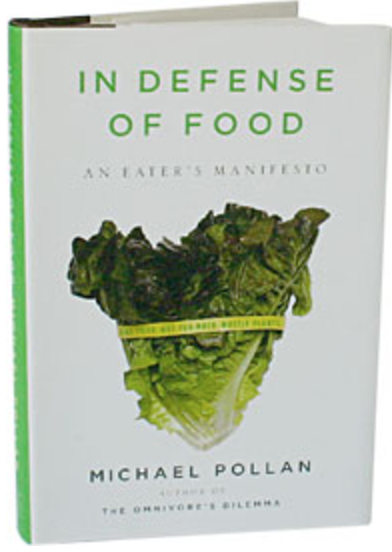 Try “Botany of Desire” Michael Pollan’s latest book, “In Defense of Food”. If you’re already vegetable gardening, you’ll be encouraged to continue and if you’re a flower gardening purist, it just might encourage to start growing vegetables. “In Defense..” is a continuation of Pollan’s “Omnivore’s Dilemma” a ground-breaking book that blows the lid off agri-business and sends you running toward those wonderful Farmer’s Markets.